U.S. Air Force photo by Tech. Sgt. Benjamin W. Stratton. Jim Schoff joined Dr. Sayuri Romei, Sasakawa USA Fellow for Security and Foreign Affairs, and a group of two dozen policy experts for a policy lunch discussion on the impact of U.S. political turmoil on Japan’s foreign policy. The event took place on November 14, 2018 at Sasakawa USA. Schoff, who is Senior Fellow for the Asia Program at Carnegie Endowment for International Peace, started the discussion with a summary of the internal factors that have impacted recent political change in the United States. Growing income inequality has been exacerbated by the Great Recession, Schoff said. Since then, the richest earners were able to recover financially, but the bottom 50% continues to climb back. Schoff also noted demographic change in the United States as a factor in increasing isolationism. For Japan, these developments have challenged the view of the United States as a reliable partner. Now, Japan may have to hedge against domestic changes in the United States that make the country unable or unwilling to support Japan’s overseas supply chains. Schoff noted that Japan’s National Defense Program Guidelines typically start with Japan and its needs, then look at the United States and the U.S.-Japan alliance, and then looks at the international arena. For Japan, China and the Korean peninsula factor heavily into its defense posture. Its foreign policy has recently been more active, with more overtures to other countries. 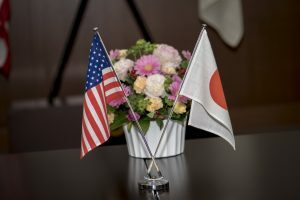 At the same time, Japan has leveraged its investments in the United States to continue working with the private sector and local governments and secure its supply chains. Moving forward, Schoff suggested that since Japan cannot resolve domestic issues in the United States, it should focus on broader challenges created by globalization, and should push the G20 towards governing norms on areas such as space, the arctic, and cyber. He also urged Japan to continue working on its relationship with South Korea, since it cannot rely only on India, the G20, and the European Union to hedge against U.S. isolation. During the discussion, participants addressed Japan’s evolving immigration policy and potential outcomes, Japan’s work on ASEAN connectivity, and the need to continue investing in U.S.-Japan exchange opportunities. Schoff suggested that increased immigration to Japan from other Asian countries will deepen Japan’s relations with its neighbors, but this could result in an anti-immigration backlash if economic issues arise. In terms of ASEAN, Schoff said that Japan’s relationship with Southeast Asia may result in a “go-along to get along” dynamic. Finally, Schoff acknowledged that while U.S. isolationism may be difficult for the Japanese government, appeals to the idea and value of friendship will allow U.S.-Japan relations to persist.